There is a plethora of cameras for the hunter: Trail Cameras, Deer Cameras and Game Cameras that will give you detailed, clear, and high-resolution images without spooking the game you are pursuing. Hunting optics are a practical product when you want the best of the best trail camera. Whether you are a woman, man, or youngster getting started with your dad, you will always want to be watching out for predators or other animals roaming about your own yard, rural living area, mountain or open spaces, and especially at your hunting spot. Trustworthy and dependable brands are reviewed here at affordable prices for your hunting prowess. When you become annoyed at seeing something peripherally or straight on and not recognize it, you definitely need a camera for scouting things out. It’s not all that difficult buying a good trail camera. You will want one that matches your needs hunting game. You will want specific features yet want even more qualities as time goes on. Do you want motion detectors? Sharp focusing? Super-resolution? Pixel numbers? Memory and Cell Cameras—are equipped with an SD (secure digital) or SIM (subscriber identity module) card. First off, is a micro-SIM card the same as a micro-SD card? No, they have different functions. An SD card cannot do what SIM cards do. SIM cards identify you to a network. SD cards simply store information such as pictures, music, videos, and apps. The SIM card recognizes you at the network to use the service provider’s capabilities. Most will hold 32 GB of memory. 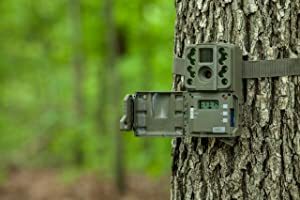 Having that out of the way, almost all good trail cameras have SD cards so you can upload to your computer or other digital product to see what the camera captured for you. Cellular cameras take the pictures and you can upload with your phone, computer, tablets, or other devices. The tiny cards about the size of a postage stamp are inserted in the small slot in your camera, or cell phone. You will need a GSM (Global System for Mobile Communications) provider such as AT&T and T-Mobile as of 2019. Sprint or Verizon’s technology called CDMA (Code Division Multiple Access) are not compatible with each other. CDMA is the cell network technology of the USA and a few other countries but most of the world uses GSM. I’m sure you know what you have for your camera purposes for memory storage. With these devices, there are no wires and many cameras are activated by motion. They are typically compact and are perfect for the outdoors and indoors. Being extremely portable, they are convenient to use from place to place. In the woods or forests, they are not easily seen and easy to camouflage having no wires draping all over the place. Know the number of hours the batteries will stay alive and have spares. Be sure your camera has an indicator to let you know the battery status. The SIM card needs your service provider or it cannot transmit pictures in the wilds. Remember, a cellular camera can be hacked via the Internet connected to your phone. Use precautions to prevent this from happening. Motion-Activated Cameras—are perfect for indoor and outdoor shooting. It needs no manual or remote intervention by you or the user. You install it and forget it. 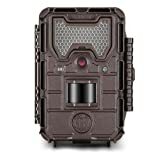 Being activated by motion, this is the best trail camera for wildlife photography and having it watch the night area while you sleep. It needs precise timing and has a window of time and will meet your requirements. This camera can be erected in a setting that might not be advantageous to a person being there. In its range known as the ‘detection area,’ it will take pictures; if movement occurs outside the area, there will be no pictures. With this said, buy a better-quality motion camera for the crisp images you want to capture wherever. When you are thinking of buying this type camera, check for sensitivity and range. Without these quality features, you will be dissatisfied with your purchase. Wireless Wi-Fi Cameras—have built-in transmitters to transfer your images using a wireless network, or a docked system at home with Internet modems. With no wires, you use your wireless network receiver in the camera to connect to both. Wi-Fi is used very much today and is user-friendly and easy to do in or out of doors. Simple installation by tech-savvy folks and easy to operate. Using USB cords is not necessary for sharing with Wi-Fi features. Being almost wireless with good camouflage, it is promising working outdoors. Outdoors can impede the wireless signals. Your Internet and wireless device is what is necessary for transmitting images. Will you have that signal? If not, sending the images will not happen outside the range of Wi-Fi. The Internet can make the camera susceptible to cyber-attacks. You cannot transmit outside of a Wi-Fi enabled area. Some far off areas do not have cell phone towers, much less Internet. Flash Cameras—are great for nighttime shots. These cameras will switch to the flash mode automatically for the image. Available in many sizes for movability. Capabilities for zooming is best with flash cameras. The flash on the front can be very aggravating if it continues to be sensing for a need of light scaring the wildlife. Flash cameras make a shutter type sound. The flash noise frightens animals. The flash can irritate others. Security Cameras—also known as surveillance cameras are a good solution for keeping track of what’s going on around your home to include the inside as well as a business or storage area off site. This is invaluable for those in the woods hunting or simply camping wanting to know what’s going on around them. These cameras are tamper resistant and not partial to what they see. The camera will record everything in real time all the wild life and any troublemakers in its sight. Play it back to see what went on while you were away or sleeping. You will feel secure knowing everything is being recorded at your home or other places. Typically used for homes and businesses, these cameras are now used on the trail and when hunting. They let you know of any dangers when hunting or camping. These cameras are not so effective in the wilds and have no proven results in the woods. Laws preclude security cameras in private places such as baths and toilets. If you record this in your home, it could end up on the Internet. Be sure to delete this type of private information in picture format. Infrared Cameras—are wonderful as night eyes for recording and tracking. It carries a large amount of video footage and no camera is better or more sensitive than this one. They have high resolution catching clear nighttime pictures in the wilderness. The sensors toggle from the infrared being on or off. Infrared cameras are strong and robust. Easy to install, they are a single component with its lens and large recording storage capacity. They withstand tampering and intentional damage. They are costly so are not used for home surveillance or smaller enterprises. With their LED lights, they are not beneficial around surfaces giving off a reflection making the image a splotch if light is mirrored back at the camera. This concept clarifies the sensor on your camera to notice, identify, and perceive any moving things in front of it. Feet are used for the measurement by most people. Some cameras can identify objects up to 100-feet away. The operating angle or field of view of the camera for capturing movement. A fast trigger speed camera because animals do not stay in one place long. Videos or Images or Both? People typically want to see single images because they are of better quality and use less storage space. Some of today’s trail cameras can create HD (high definition) videos having the same clarity and quality as single images. This can be supported by external memory up to 64 GB. Therefore, storage space is not a consideration these days. Trail cameras are an expensive piece of equipment for the hunter. It is imperative you are not a victim of theft. A good security cover will protect you against you camera being stolen. These covers can easily be tightened or released usually made of hard plastic or metal. For protecting your camera from shock, falling, and the weather, a cover should be vinyl coated. You might want a camouflage coating to deter noisy eyes from spotting your camera. You will no doubt want a backlit LCD (liquid crystal display) for viewing your shots. A good quality trail camera with a great display function can drain your batteries quickly. You will need to decide what features are the most important to you and what your budget allows. Wildlife trail cameras offer different methods for capturing pictures. They might be preprogrammed to a specific schedule for making the most of coverage. Some cameras will take short video clips in HD. You can select from different styles to include motion-detection, time-lapse, and infrared (IR)-activated. You’ll be delighted and thrilled with what you see! Sure, you can buy an inexpensive camera and some might be adequate, yet they might not have great range needed by you and are slow to respond. We will discuss here the performance of cameras—the images captured and different types of flashes. Important features of a trail camera are wide angle pictures and a great span and breadth as ranges. Video bursts are a series of photos that eat up your memory quickly. For the best results, use a fast trigger response for quick and fast renewal. Battery life and memory size will influence you for the trail camera you are contemplating buying. Functions of importance are date and time stamps, password protection, and audio recording. We will discuss features of the cameras reviewed here. Budget is always a consideration when buying anything. Be sure it fits your budgetary matters to factor into your hunting gear arsenal. The Moultrie® mini camera A-20, item model number MCG-13129, is a better yet smaller version of the great selling A-5 camera. This new model has a sturdy and hard-wearing small case and 12 MP (megapixels) for greater image resolution with super detail. The fast trigger speed occurs in less than 1 second with a 50-foot range of detection. Better than its predecessor, the A-5, this affordable camera with its high-performance quality vivid color pictures during daylight has the ability to give you infrared (IR) pictures at a long distance in the dark that are black and white. The tough outside case that resists harsh weather is standard. The LCD screen is easy to see and it runs on 8 each AA batteries for 16,000 images at your hunting place, home, or business. The infrared flash has 32 LEDs with 850 nm (nanometers) the wavelength of the light in nighttime dusk to dawn infrared technology at 50-feet from the camera. You can take single shots or multiple shots and the 2 resolution settings are low (1600x1200px) and high (4000x3000px) with capture of 4:3 aspect ratio video in 480px. The maximum delay options between photos are 0-, 15-, and 30-seconds, and 1-, 5-minutes. See more in the instructions. You can carry out tree mounting with the 1/4-20 bottom tripod mounts and slots at the back. Use it with the nylon strap or Python lock cable and lock (sold separately). The strap for mounting is included. The camera works with SD/SDHC Class 4 cards or higher and can handle up to 32 GB; memory cards are sold separately. If you use lithium batteries, you will have more battery life when in severe weather. You can also use the Moultrie® 12-Volt direct current (DC) power source or alternating current (AC) power mode. When this camera detects that the battery level is 15% or below, the Low Battery screen will appear and the camera will turn off automatically. The dimensions of the camera are 5.35-inches high x 3.39-inches wide x 2.48-inches deep and it weighs about 15 ounces. This camera has no audio or time-lapse capability. The A-20 does not have a security function on it for a password. Gift-wrapping is available for a friend or loved one. You will receive a User’s Manual with excellent instructions and illustrations and a 2-year Warranty. Video from the manufacturer here. Bushnell® of Overland Park, Kansas, has been making quality cameras since 1948 and is a highly-regarded company in the USA. 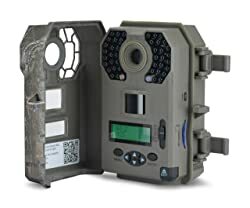 The model number 119836C Trail Camera comes in black and this will soon become your preferred camera when hunting or installed at your home or business where you want security with pictures. Set this camera up to see everything that’s going on in the wilderness with its extensive features. This top seller on Amazon.com® is a must have! Hang it on a tree and start hunting. Capture your images using 3-, 8-, or 12-MP (megapixels) for the best high-quality vivid color imaginable. When deer bed down during the day and feed at night, normally, you will capture what you want to see in the dark. Its passive infrared (PIR) used is not only in cameras, but motion-activated cameras, lights to be activated, and other security devices. All living things emit infrared radiation. The PIR is adjustable from low, medium, and high. It has a slot for an SD card that you will need to buy separately. The camera is waterproof, but it’s not recommended to submerge it under water. You cannot view the pictures on the screen; upload the SD card to your computer or other device. It does not have a 120-VAC power supply port. The dimensions are approximately 9.2- x 5.5- x 3.2-inches and it weighs about 8.6 ounces. Temperature Range: minus 5 to 140-degrees F.
Gift-wrapping is available for a friend or loved one. You will receive a User’s Manual with instructions and illustrations and a 1-year Limited Warranty. The STEALTH CAM® G Series cameras are evolved and the model number STC-G42NG TRIAD® with 10 MP for 4 resolutions (10, 8, 4, 2 MP) is outstanding. The 42-inch IR Retina™ low-light sensitivity is a feature for good picture quality during dusk and early dawn and will reach to 100-feet and never scare off the wild life. High-density video recording with audio is from 5- to 180-seconds. It has a time-elapse function with PIR (passive infrared) override. The menu is backlit for easy-to-see programming. This camera uses a standard mini-B USB for video output and you buy the cord. This camera is loaded with features including its Matrix® blur reduction. With the 0.5-second Reflex™ trigger and burst function of 1 to 9 pictures for each time you trigger, you will have many pictures in no time. Set a secure password for security along with the date, time, temperature, moon, and name stamps. It can shoot manually and has an SD card slot for up to 32 GB. The 1-1/2-inch strap will fit around a tree but does not have the quick release function. The angle of view for this camera is about 50-degrees. There is no picture viewing screen; therefore, you will need to remove the SD card and put it in your computer or other device to see the pictures. The dimensions are 5-1/2-inches high x 4-inches wide x 2-1/2-inches deep and weighs 19.2 ounces. How to use this camera is here. The Browning® is a good performer out on the trail with its camo finish. The BTC5HD model number combo comes with the camera, 8 GB SD card, and 6 batteries. Photograph anything with its fast 0.67-second trigger speed for 10 MP images. It will record 1280 x 720 HD videos with sound (5 seconds, 2 minutes’ length) with infrared LED illumination at night at 100 plus foot flash area. It uses zero blurring technology and has the Browning® Buck Watch time-lapse viewer software that’s so convenient when hunting. It takes great color day shots and black and white night pictures. The dimensions are 4.5- x 3.25- x 2.5-inches and weighs about 15 ounces. Browning® Strike Force video here. The Spypoint® model Solar with the sun’s capturing panel on top, is 12 MP and has camo to hide in the trees without being seen. One lithium ion battery is required and is included in the box. It can also use optional 6 each AA batteries (not included). It offers a 100-foot detection range and has a time-lapse function. The HD video also records sound. The 42 LEDs are super glow with no blurring of images for superior nighttime quality. With the curved motion sensor lens, your distance and detection angle is enhanced with the sensitive 5 detection zones. It is weather resistant taking pictures and HD videos in color during the day and black and white at night, with sound and 6 pictures with each detection. The continuous photo mode first (hybrid) video can be viewed on the 2-inch screen. The infrared automatically adjusts for mounting ease and configuring your camera. It uses up to 32 GB SD/SDHC memory card (not included). Set the time, date, moon phase, and temperature stamp on each photo. The dimensions are 3.8-inches wide x 3.9-inches deep x 6.9-inches high and weighs about 14.4 ounces. Gift-wrapping is available for a friend or loved one. You will receive a mounting bracket, strap, User’s Manual with quick-start instructions and illustrations and a 1-year Limited Warranty. Spypoint® Solar Trail video here. The Stealth Cam® reader viewer model number STC-CRV43 has a 4.3-inch LCD screen for seeing your videos and images from your trail or game camera while you are out there in the wilderness. The SD memory card slot supports up to 64 GB and the device incorporates a 3.55 headphone jack or MP3 audio feedback via its internal speaker. It reads Class 10 SD cards. The buttons for operating are rubberized including the frame. The ABS plastic housing is tough and durable for the woods. It has a USB port and the cable is not included. The power is 4 each AAA batteries (not included). Remove the memory card from your camera and simply insert it in the viewer to see your videos and pictures at once. The viewer can pan, zoom, scroll, and delete single pictures or all pictures at once if you do not want them again. Be careful with the delete function! You might want to upload the images to your computer first. Once they’re gone they’re gone! Be sure to read the instructions before using the reader viewer. The unit automatically shuts off and is programmed to do so. For safe and easy carrying, a wrist lanyard strap is attached to the viewer. This reader viewer works with any brand camera. It has a mini USB port but you will need to buy the cable separately. Its video playback resolution is up to 720P. The dimensions are 9.8-inches wide x 1.8-inches long x 6.8-inches high and it weighs about 1 pound. 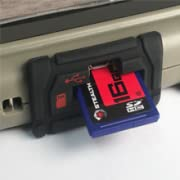 Stealth Cam® SD Card Reader Viewer video here. With today’s technology, we can have it all—virtually instantly! When you are chomping at the bit to know where the game is after you get your license to hunt, check out the best trail camera listed here to give you an edge. If you need a viewer-reader for seeing what the camera captured, we have that too for you above. Read trail camera reviews from customers online for their experiences with any of the brands reviewed above. Always check for a great Warranty. Happy hunting and always be safe out there!